In this one, servo is programmed to be controlled by two buttons, one turns servo to the left and the other one turns it to the right. When the servo is turning, corresponding LED will be switched on to indicate the operation. 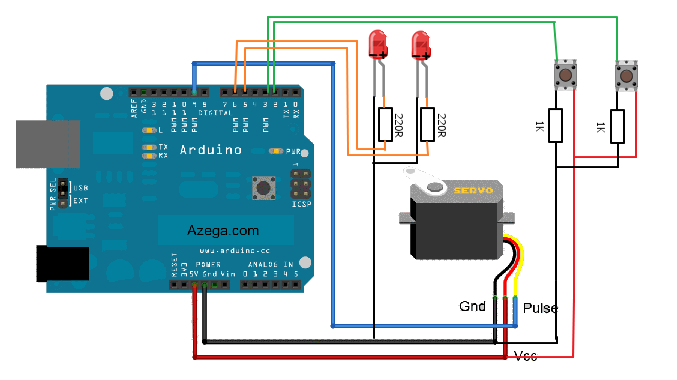 Because Arduino has built-in library for controlling servo, which makes servo a really easy kit to use. In this project, I will be using a servo to turn the IR sensor around constantly. // There are 2 input buttons (turn left and right), when button is pressed, the servo turns and corresponding LED is lit up. WIN an Arduino Uno R3 Development Board – Like to Win!